Judging by the sales sheet, this might be one of Leaf’s best looking products to date. 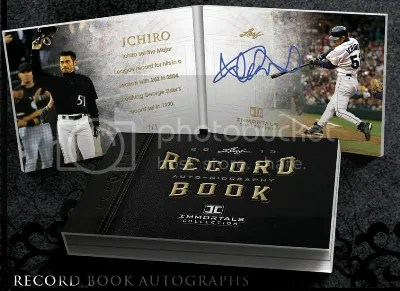 I can guarantee its going to be one of their most expensive (dealer cost is about $550 per box). 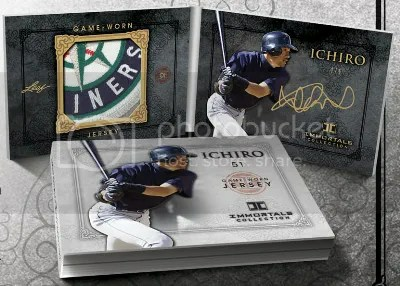 Then again, if your an Ichiro collector you already know that his stuff doesn’t always come so cheap. 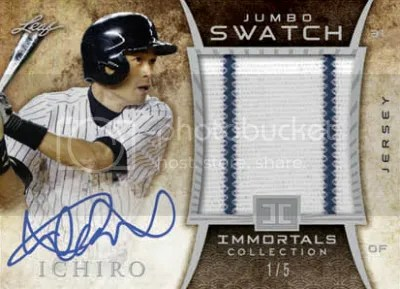 2013 Leaf Ichiro Immortals Collection gets straight to the point by having four base cards and one autograph per box. 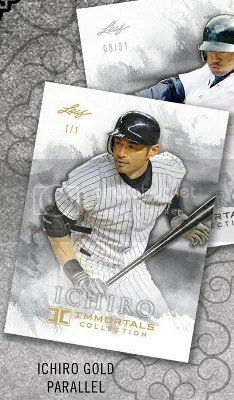 The base cards will be numbered to 51, and will have parallels limited to 20, 5, and 1. 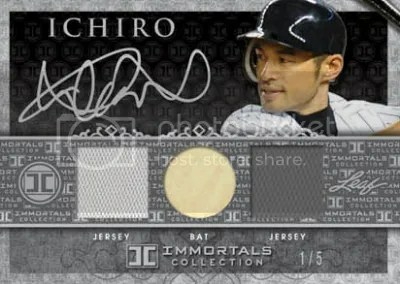 You’ll also find printing plates and the Immortals autos will be parallels of the base set limited to 5 or 1. 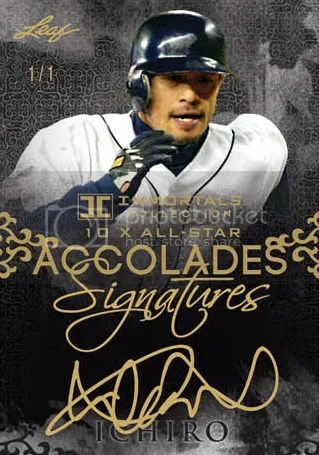 Insert autographs will also be limited to 5 or 1. 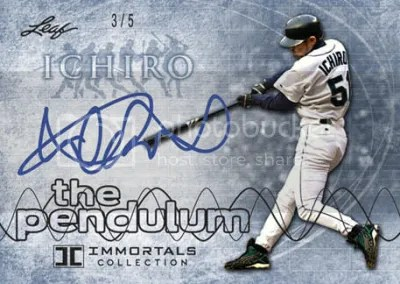 Inserts include Pendulum, Record Book Booklets, Accolades, Ichiro Signatures, Dual Jersey Autos, Triple Relic Autos, 200-Hit Autos, Letterman Autos, Kanji Letterman Autos, Jumbo Patch Autos, Jumbo Jersey Autos, Patch Booklet Autos, and Bat Booklets. 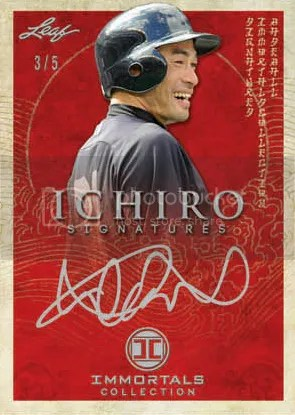 Ichiro collectors would probably like to get their hands on any of these cards, but it gets even better. 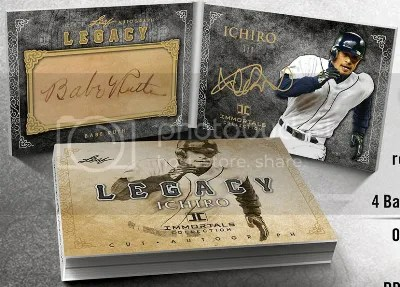 The Legacy Booklets have Ichiro’s autograph teamed up with signatures of some of baseball’s best players such as Babe Ruth, Honus Wagner, Mel Ott, Lou Gehrig, Pete Rose, and Hideo Nomo. 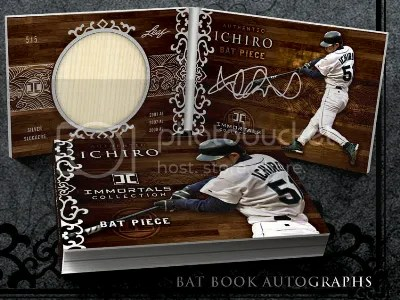 Leaf has also thrown in 1 Ichiro bat knob relic too. A majority of Leaf’s products have had the same look for awhile. 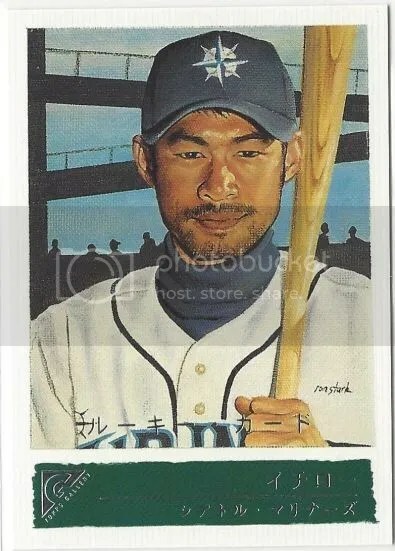 When I first saw these cards, I seriously thought Upper Deck was starting to make baseball cards again. It makes perfect sense for them to look like this too. 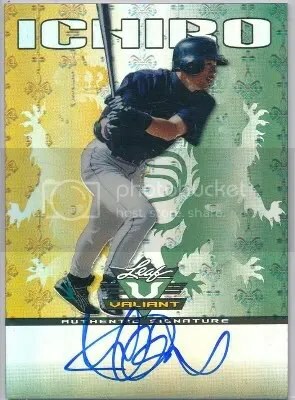 Leaf’s Director of Product Development once worked for Upper Deck. 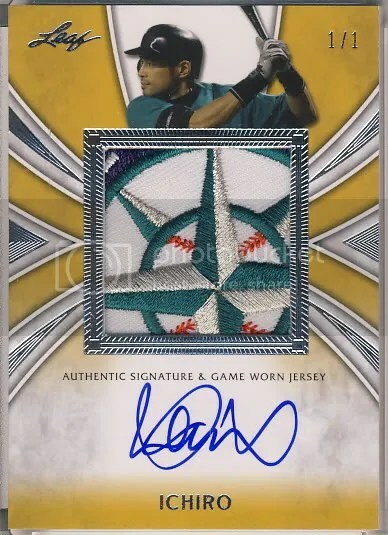 The only downside I can see to this product is that there are no team names and/or MLB logos. 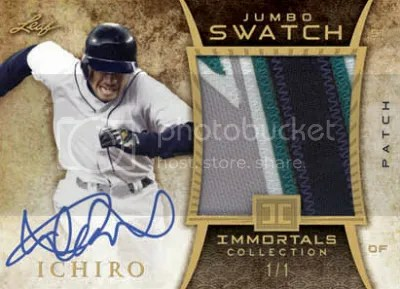 For the amount of money a box of this stuff will cost, collectors would probably want to see those two things. 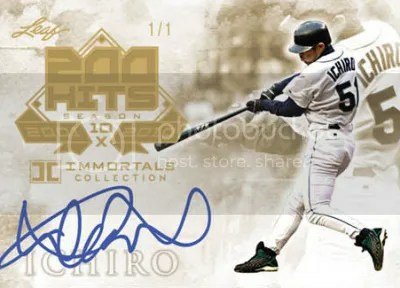 Ichiro’s signature isn’t the easiest or cheapest to obtain. 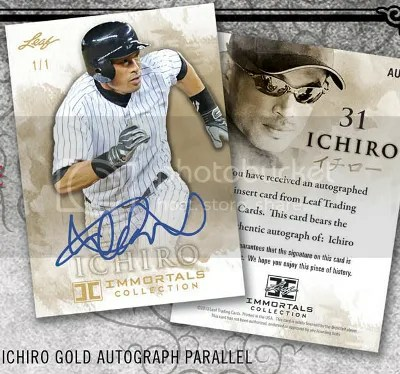 Leaf plans to make 300 hand numbered boxes and it states on the sales sheet “There will not be another Ichiro only themed set produced by Leaf.” That doesn’t mean we won’t see Ichiro pop-up in other Leaf products like we have been seeing though. 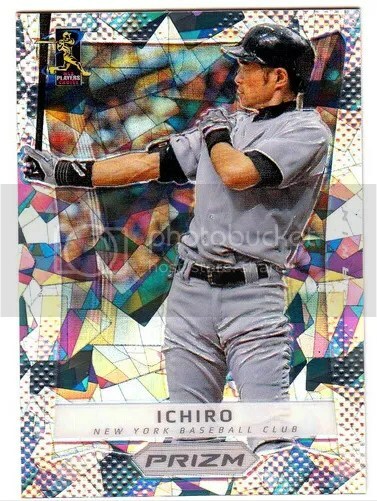 Man does this stuff look like Ultimate Collection or Exquisite. Well here you go. 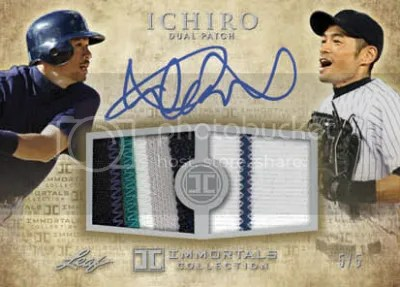 All of the Ichiro 2011 Leaf Metal Draft Baseball Ultimate Patch Autographs have been signed and are ready to be shipped. I think they look fantastic! Brian Gray announced yesterday that Leaf has never purchased anything from those six dealers involved in the fraud case that was unveiled this week. Leaf was the first manufacturer to come out and state their position and I think it is something that all manufacturers should do. 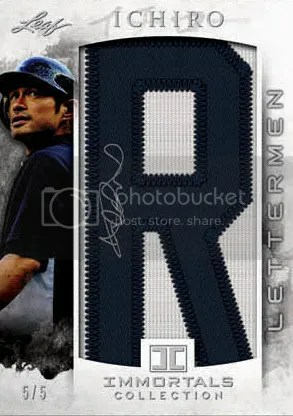 For a relic to be 100% authentic I think it should come from the team, league, or individual athlete. Not these off-the-wall dealers that sit behind a computer all day printing off meaningless COAs. 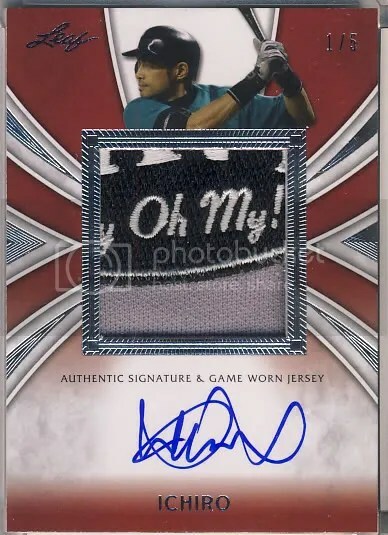 The day might come where we have league run card manufacturers to make sure everything is authentic. 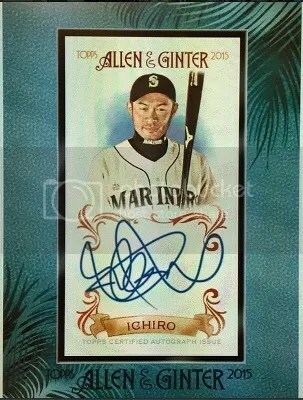 Or perhaps the day will come where we only have one manufacturer that deals directly with each league. It sure sounds like a monopoly, but it could work.